The development of the excellent Soviet fighter, the Yak-9, did not end with the close of the Great Patriotic War. With the availability of the more powerful VK-107A engine and all-metal construction, the Yak-9U & P remained fomidable adversaries even at the dawn of the jet age. These ultimate piston-powered Yaks were supplied to countries of the Eastern Bloc in Europe, and also to China and North Korea. Although these are little-known variants, being overshadowed by the exploits of the MiG-15 during this conflict, the Yak-9 did confront UN forces. The latest release in Mushroom's Yellow series is a useful and detailed reference on this successful yet undervalued fighter. The author, Robert Panek, adopts a logical approach to the subject. 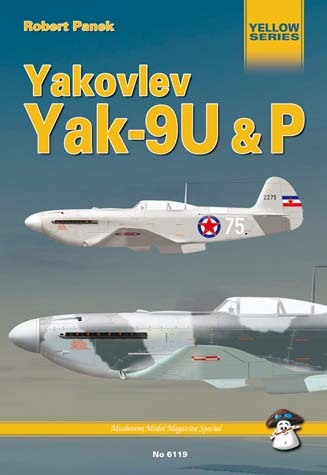 The text starts with a description of the origins of the Yak-9U and P followed by a description and technical data. These chapters are supported by excellent 1/72 scale drawings of each version and scrap views of the most important variations in armament, canopy and cowling arrangements. Following this introduction we are treated to some summary tables and an outline of the aircraft in service. The six colour photos of various wrecked Yaks being inspected by American troops during the Korean War are very interesting. The next 50 pages provide walk around photos, including access to some of the most out of the way areas imaginable. These are a combination of photos of restored and stored Yaks, and a number of contemporary (but equally useful) black and white images. This section also includes technical drawings where appropriate. The book is rounded out with a whopping 52 side colour profiles of various late Yak-9s, plus two plan view illustrations of upper and lower surfaces. The quality of the artwork is very good and the schemes are varied - even including an overall light grey example in US markings. Mushroom's "Yakovlev Yak-9U & 9P" will be interesting to VVS, Korean War and modern Eastern Bloc enthusiasts, but will be especially helpful to modellers due to the ample detailed reference photos and line drawings, plus the inspiration of the attractive artwork. It is only a shame that we do not have a plastic kit of these interesting yet little known variants in larger scales.